This would make a superb and easy festive cake, would you just look at the way that topping looks like jewel encrusted gold. 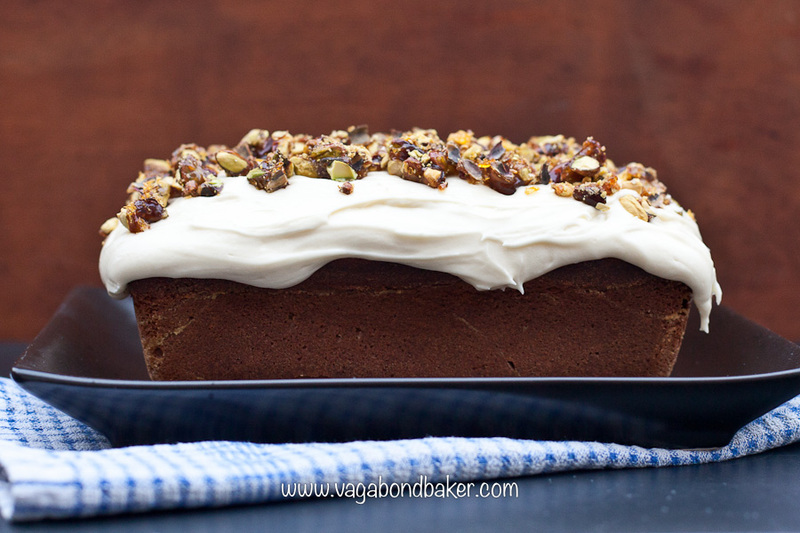 I created a completely delicious salted pistachio brittle/praline to decorate my pistachio loaf and I couldn’t be more thrilled with the results. 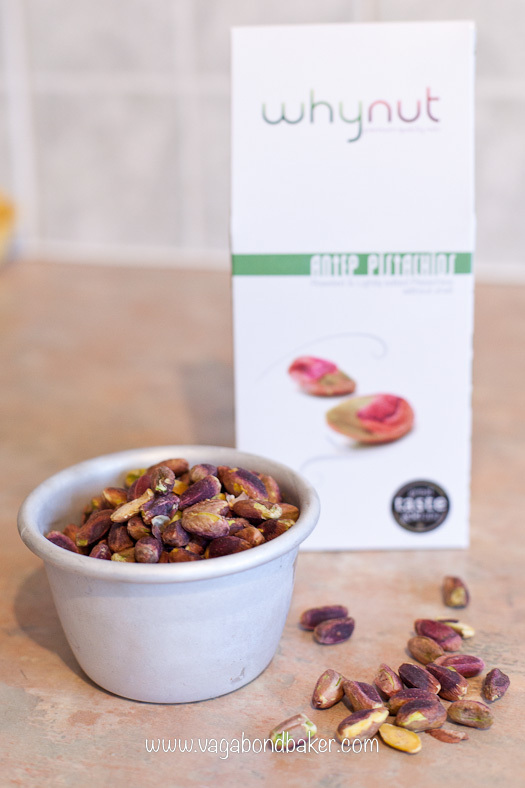 The brittle is crushed and broken a little and scattered over the cake, the contrast of the jade pistachios and the golden sugar looks spectacular and the slight saltiness of the nuts is so moreish. We had taken the train from Yorkshire back to Fife, Scotland for a short visit back home to see friends and catch up with our mail. My mind drifted to wondering what I could bake in the few days I had before we set off the London. I am completely without my kitchen and ingredients as the van is now in storage so I was limited to what equipment and ingredients I could find here at our friend’s house. 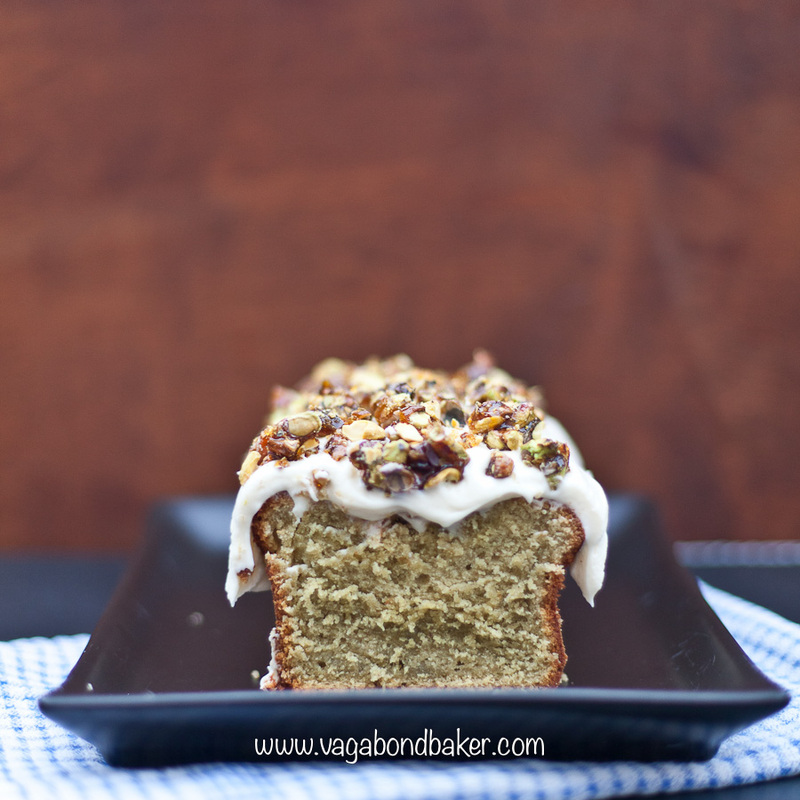 I really wanted to get a few little bakes in before we set off on our Far Eastern travels. There were a few loaf tins in the cupboard and I had all the ingredients for cake. I had a small pot of pistachio paste to experiment with so I added it to a sponge batter to flavour and colour it. The paste, from Why Nut, is a bit of a luxury ingredient but it’s easy to use and wonderfully natural, 100% nuts and no artificial anythings. To decorate it I simply made a white chocolate cream cheese frosting as I had a bit of white chocolate and there was a tub of Philly in the fridge! Wondering how to make it look more interesting, I suddenly remembered the hazelnut praline recipe I’d found in Switzerland and tweaked it a bit for some roasted, salted pistachios. 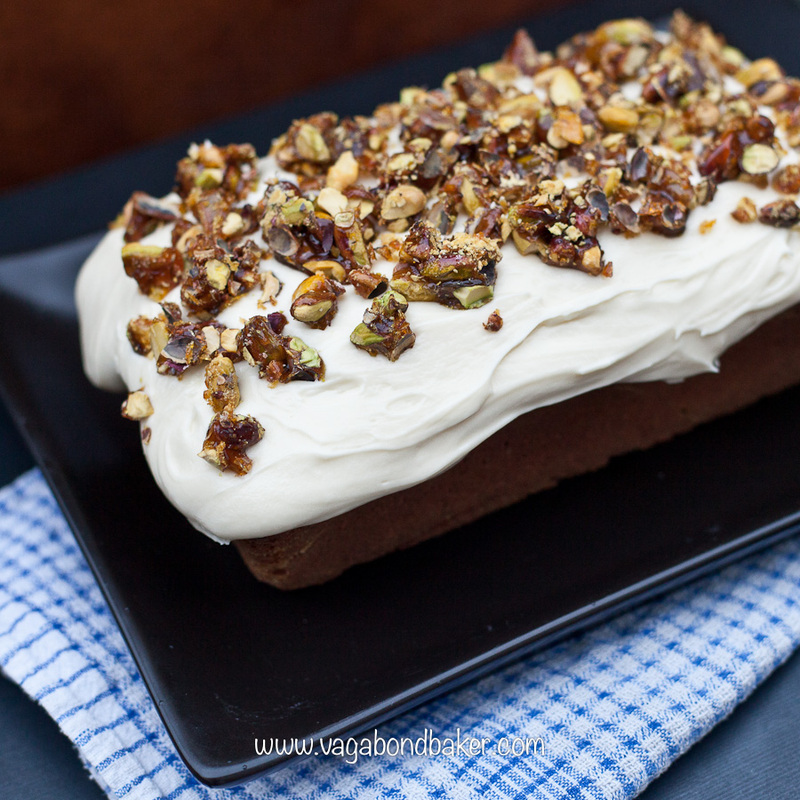 Even if you don’t make the cake, you must try the Pistachio praline. It would be great on many a festive bake or sprinkled over ice cream. It looks so fabulous, not to mention ridiculously tasty. Cream the butter and the sugar until pale and fluffy. Add the eggs one at a time, beating in well before adding the next. 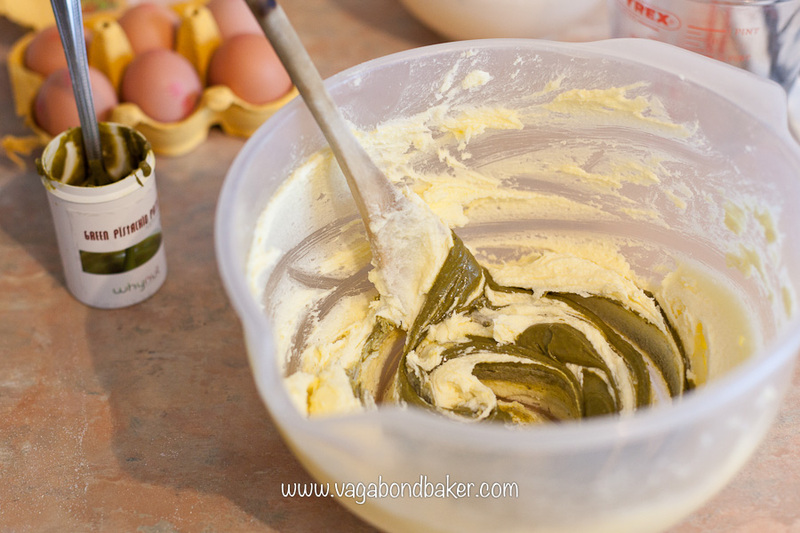 Mix in the pistachio paste and the batter will turn a glorious shade of green. Sift in the flour and fold in with a metal spoon. 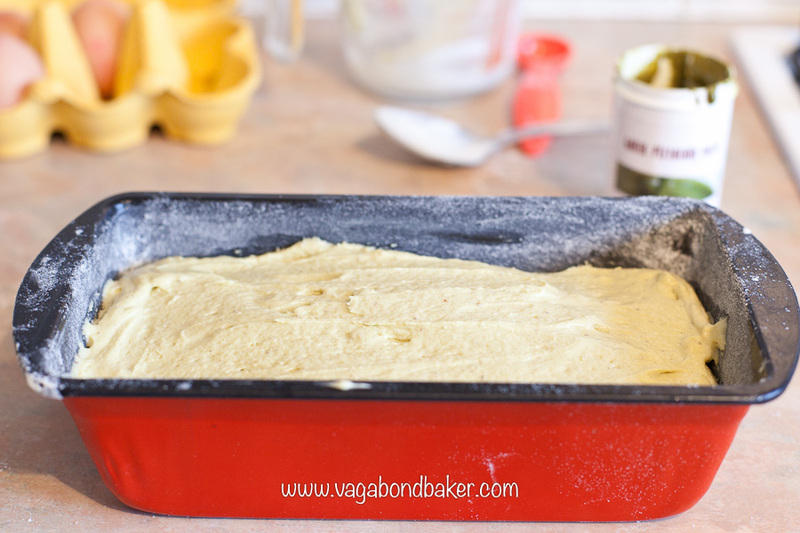 Spoon into the prepared tin and bake in the centre of the oven for around 1 hour to 1 hour 10. It should be risen and golden, an inserted skewer should come out clean. Cool the right way up on a wire rack. While the cake is in the oven, make the pistachio brittle as it needs time to set. Have ready a clean ceramic or Pyrex plate. 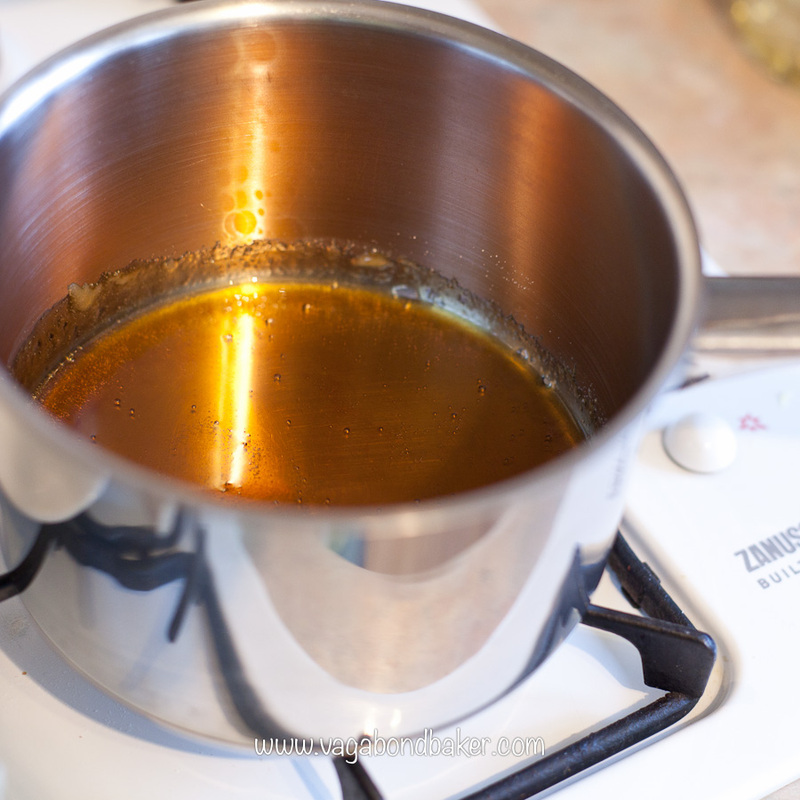 Place the sugar in a wide saucepan and melt over a fairly low heat, without stirring. 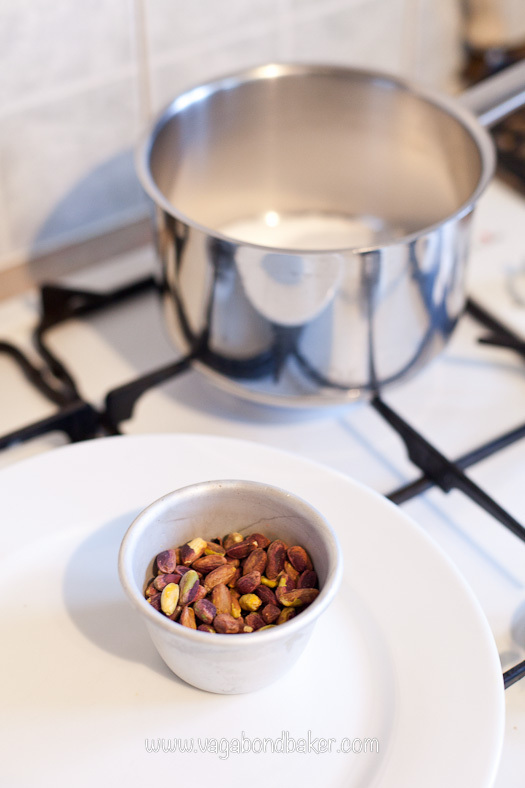 Once the sugar has liquified keep your eye closely on it, wait for it to turn a rich tan colour then quickly add the pistachios and stir in. 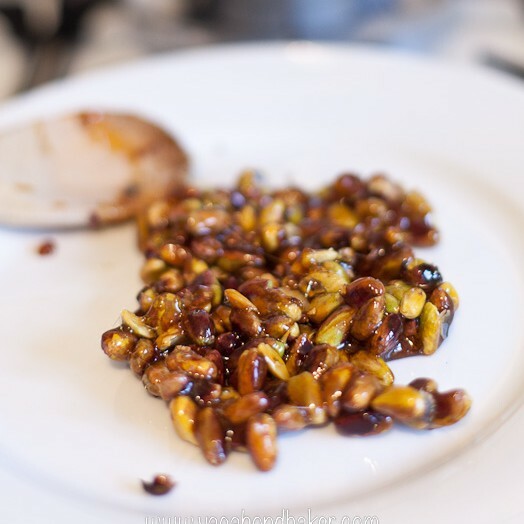 Now quickly tip the sticky pistachios out onto the plate and leave to cool and set completely. If you let the pan cool then fill it with hot water, leave it to soak for a few minutes and the pan will clean easily. Once the brittle is completely cold, crush it a bit with the end of a rolling-pin or something similar to break it up and reveal the green of the pistachios. A festive golden rubble. 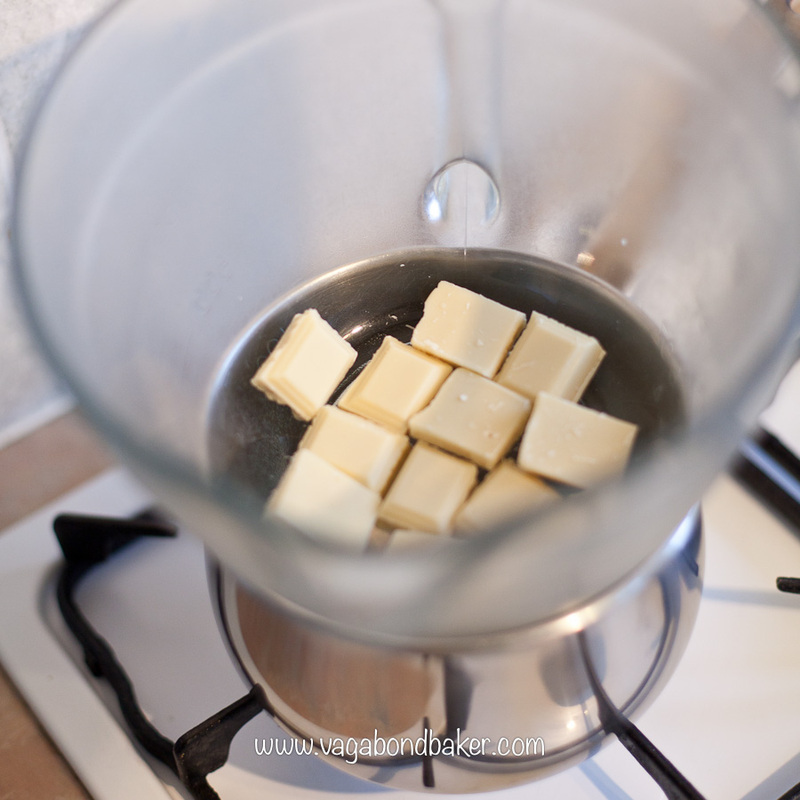 Gently melt the white chocolate, either in a microwave or in a bowl over a gently simmering pan of water. Set aside to cool. Beat the butter until smooth and pale, add the cream cheese and continue beating for a minute or so until fluffy. Add the white chocolate and beat that in, along with the vanilla extract. Sift in half the icing sugar and mix in, then sift over the rest, beat it in and there is the topping for the cake. Just enough for a generous frosting for a loaf cake. 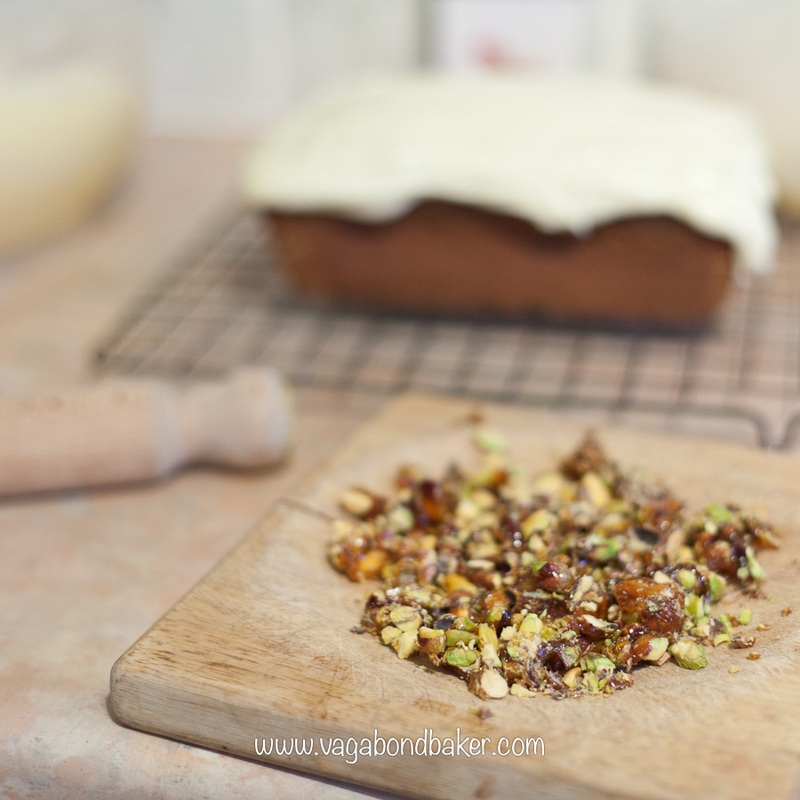 Spread the frosting over the top of the cake and sprinkle over the pistachio brittle rubble. hope you are enjoying your adventures in Vietnam now! 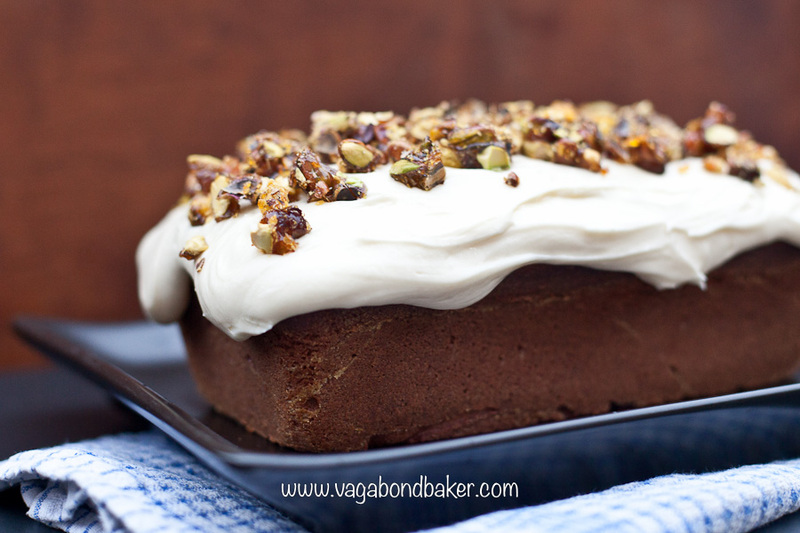 this pistachio loaf cake is more indulgent than your usual loaf cakes. love the use of the pistachio paste(oh, what a luxury!) and how it is topped with a pistachio praline! the crunch would be so lovely! A beautiful cake, Rachel! Thank you so much! I’m not in Vietnam yet, I’m in Warsaw, Poland! It’ll take me a few months to get to Vietnam by rail! This looks gorgeous – definitely going to try this one out! Wow and wow! Love that frosting! Thank you! Super yum, super pretty! Aw, my apologies! I should have posted it at the weekend but I ran out of time! Glad you like the pics, I thought they might be dreadful as it was such a dark, dreich day and it was practically twilight by the time I got round to photographing it! ISO was at a gazillion!